8-9 October 2015. We’ve been travelling for an hour or so, with a quick stop along the way for our guide to dive into a store to pick up boxed lunches for everyone. We stop in the middle of nowhere. Pretty much all that’s around is the building we’re about to enter surrounded by the sere Jordanian desert. I’m not sure if it’s a restaurant or not, but it is a souvenir shop, and there is a room with a long bench for us to all sit on where we can balance our lunches on our knees. We’re told as we exit the bus that we have twenty-five minutes. Twenty-five minutes for eighteen people to gather their stuff, file off the bus, collect their lunch, find a seat, order drinks, eat lunch, pay individually for the drinks one by one, look at and buy souvenirs, and get back into the bus. It’s madness. It’s especially madness since we’ve spent the morning lazing around at Petra, the entire group hanging around in the lobby of the hotel waiting for our scheduled departure time at noon. Why didn’t we leave twenty minutes earlier? 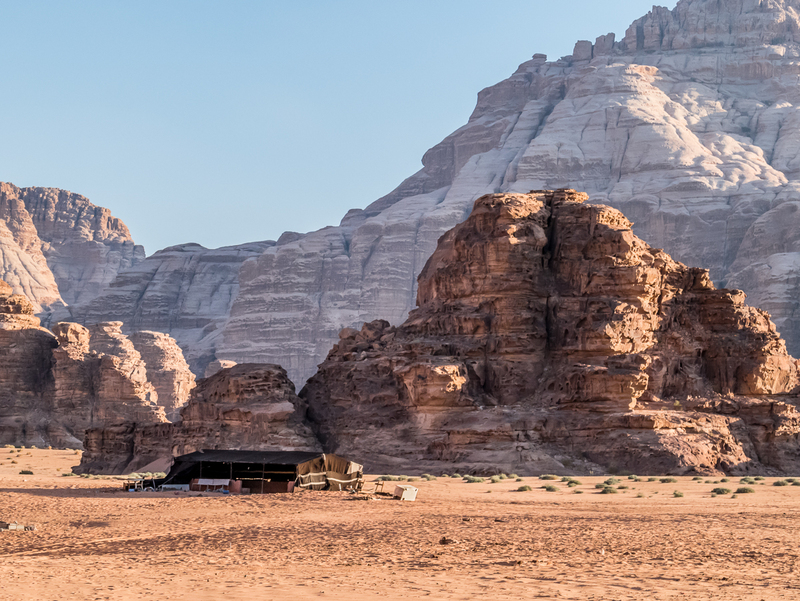 We arrive at the Wadi Rum Visitors Centre where there is a panoramic view of the rock formation known as The Seven Pillars of Wisdom, although there is no known connection between the landmark and the book of the same name by T. E. Lawrence, better known as Lawrence of Arabia. It’s a magnificent landscape but there’s no time to linger, no time to take it in. Quick, take photos; be back on the bus in ten minutes. Why didn’t we leave earlier? 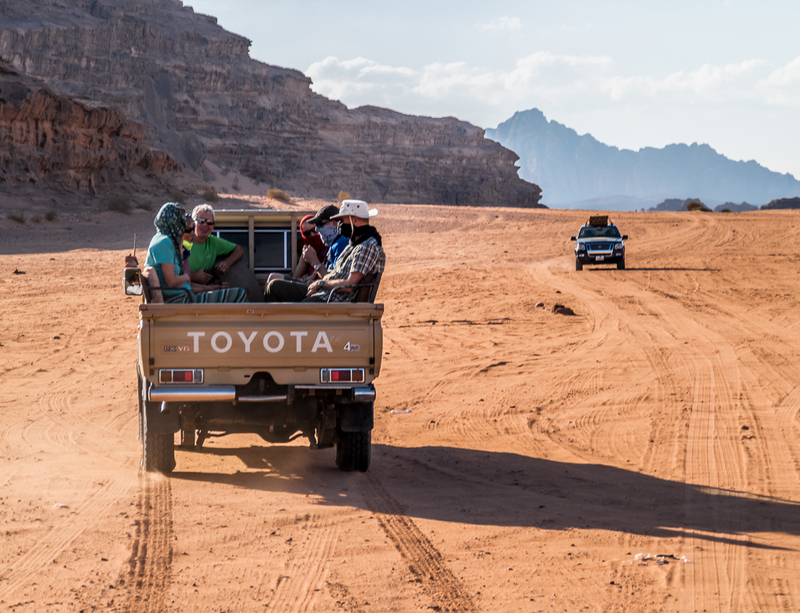 We transfer to jeeps and head off on a two-hour tour of the desert. and eventually we stop at a Bedouin café for tea. 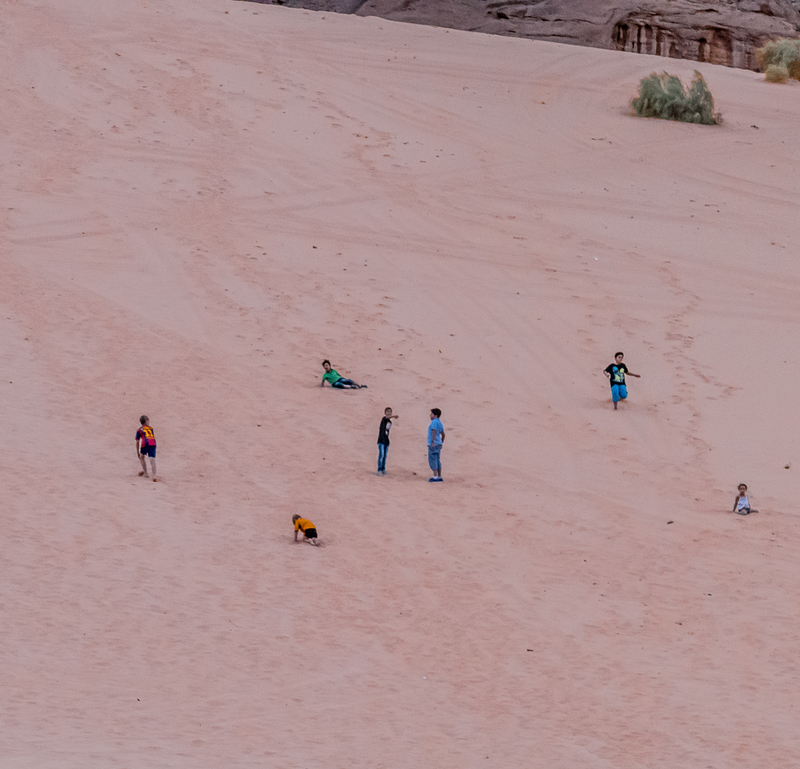 Nearby, on a high steep hill of sand, eight or nine Bedouin children play boisterously, racing up the hill and rolling down, over and over. Tumbling laughing screaming happiness. I watch them for a couple of minutes, relishing their freedom and their infectious joy. In the café there is loud endless chatter. 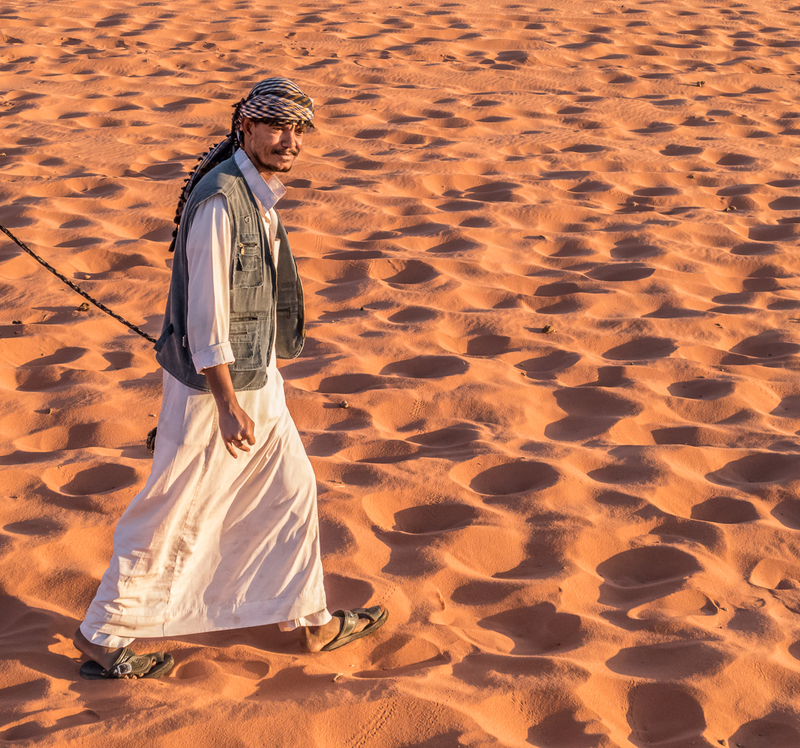 Don and I walk away and into the desert a hundred metres or so. It is a powerful ancient compelling landscape. There is a majesty here that fills the soul, and this is my only chance to really feel it. Stop. Be still. Let in the vast silence. Eternity is right here. For a brief second just feel it. This endless burnt orange land, now turned pink in the fading light, all towering rocks and shifting sands. We are dwarfed by mountains of rock. but quick, now it’s time to get back into the jeep. There is no more time to just be here, it’s time to go to the camp. 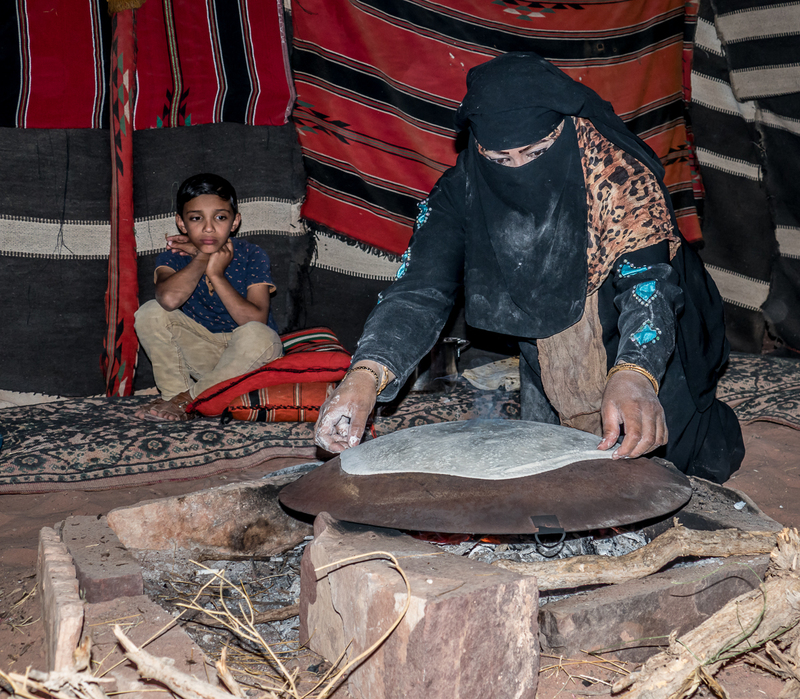 We drive to a Bedouin camp that has been reserved for us, grab our bags from the bus, take them into our tent ‘bedroom’ and begin to unpack our needs for the night, then suddenly quick, come now, gather to watch traditional bread making – interesting and very very yummy. I eat too much of it because it is so good, not like pita bread, but something more delicate. a long and interesting talk about Bedouin life during which I upload photos and do a backup. It is the only time to get it done so the camera will be ready for tomorrow. And so to bed. I lie looking at the stars for most of the night, and get very little sleep. It is the same for most of us. The wind howls all night. It is cold, though I am not. And it is very very dark. The sky is a riot of silver pinpricks. What is this place? 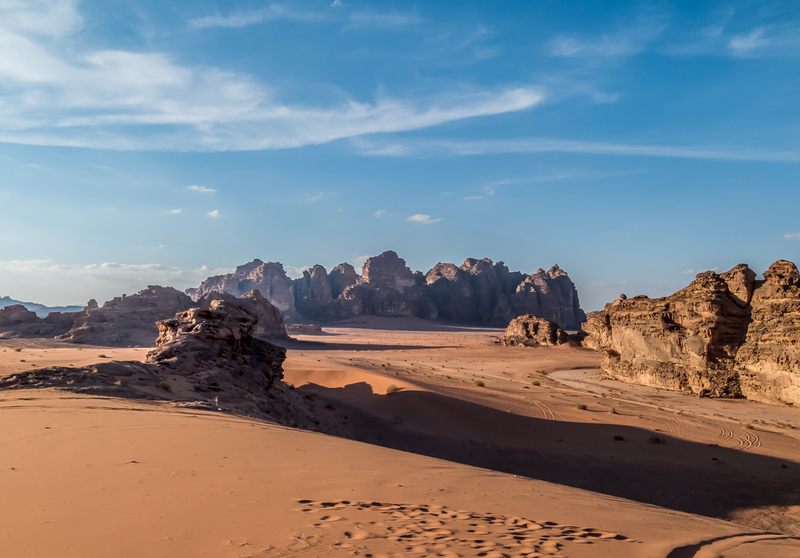 Described by T. E. Lawrence in The Seven Pillars of Wisdom as “vast, echoing and God-like”, Wadi Rum is a valley cut into the rock in southern Jordan. It is a desert wilderness of sheer-sided sandstone and granite mountains towering seven hundred metres (2300 ft) over wide sandy valleys. It is a protected area of seven hundred and twenty square kilometres. It has been home to many human societies since prehistoric times, hunters, pastoralists, farmers and traders; resilient, resourceful people who adapted to the harsh environment. And it has been home to the Bedouin for hundreds of years, some of who still live dotted about the landscape in their goat-hair tents. 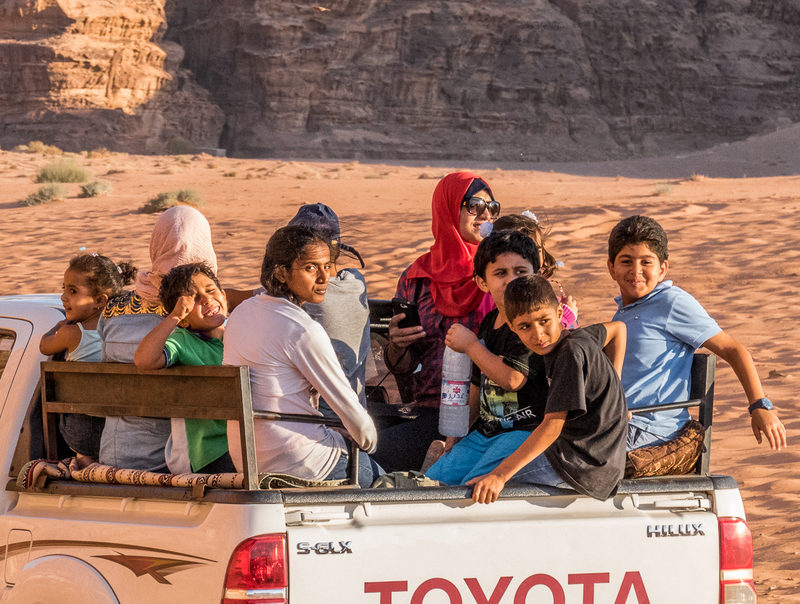 In the village of Wadi Rum they live with their tents, and concrete houses, and 4wd vehicles. There is a school for boys, and one for girls, a few shops, and the headquarters of the Desert Patrol. They were nomadic until recently. Now some are partially nomadic, and many are involved in the tourist industry. up a rocky escarpment to watch the sunrise. looking in all directions, allowing the land to speak to me. 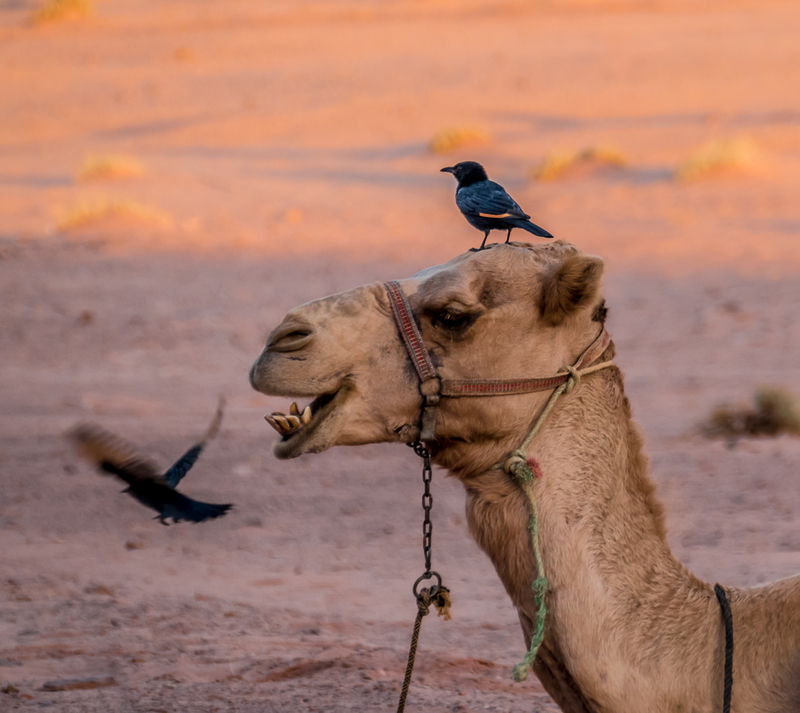 and a flock of birds flitting and dancing around the resting camels in a symbiotic relationship. I wonder to myself how birds survive in this unforgiving environment. where we rush to pack. We must be ready to leave by eight because there is a boat cruise booked in Aqaba for nine-thirty. I complain to our guide, in between hurrying around getting everything packed up and returning the mattress to our room in the tent. We are barely back from the camel ride in time to have all our bags packed and ready by seven-thirty. I go to the bathroom for a quick wash and start complaining to a fellow traveller about the rush when I realize our guide is standing right next to me. 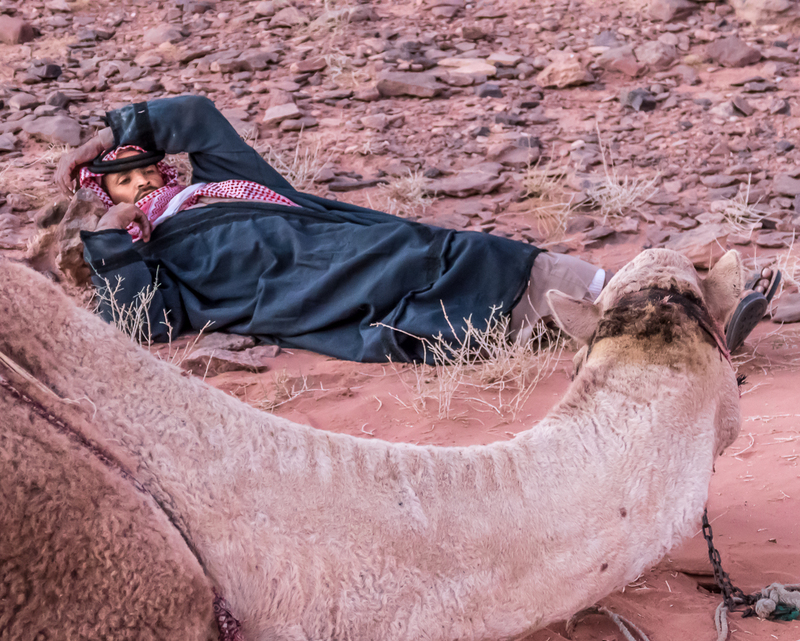 He asks what I’d do in Wadi Rum. I reply that for a start I’d have time to eat my breakfast at a reasonable pace. As it happens they are serving individually made omelets, one after the other. In the line-up for breakfast someone has to be last. I am last, and I’m not even actually served my meal until ten to eight. Our guide changes the leaving time to eight-thirty. But neither of us gets to the nub of the matter. I don’t express myself well. Yes I’d like more time to eat breakfast but what I really want is time in Wadi Rum. Our guide says, twice in two days, that there’s nothing to do in Wadi Rum, which is nonsense of course. 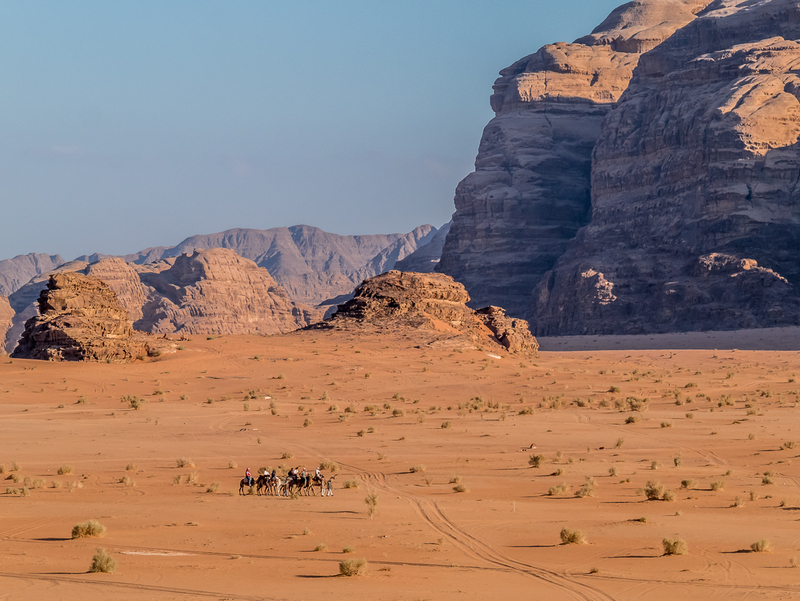 In Wadi Rum, apart from riding camels, you can hike, climb the mountains, ride an ATV, and visit a Bedouin camp. 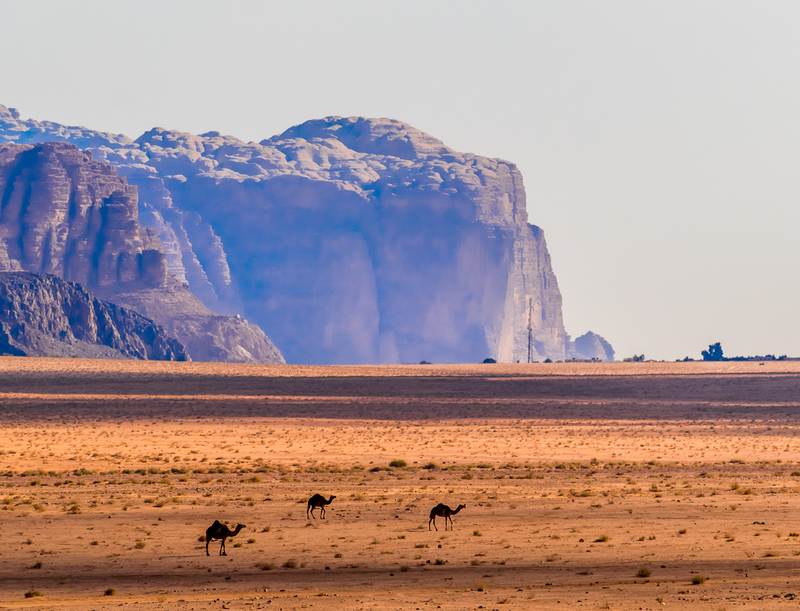 But what I really want is simply time in Wadi Rum. Time to experience the landscape. Time to wander away from camp into the vast silence. Time to let my bones absorb it. Time to just be. I wish I’d been able to express myself more clearly at the time. I wonder if we all missed out on something special because I couldn’t. Next post: Aqaba. Where we found plenty to do. © Alison Louise Armstrong and Adventures in Wonderland – a pilgrimage of the heart, 2010-2016. Thanks so much Paulette. It is an extraordinary place, vast and largely empty, and the people seem to be completely at one with their environment, a perfect and unbreakable symbiosis. Thank you Nicholas. It’s a magnificent place, a place to fill the soul. Thanks Danila. Sharing afterwards is almost as much fun as being there. It’s a gorgeous place. Such a magnificent place. I’d have to agree about the rush. On the only few group tours Ive taken I’ve found this same issue, and felt so trapped not to be able to explore at my own pace and just be. Unfortunately, in some places there is no other way. You’ve just inspired me to re-watch Lawrence of Arabia, one of my all time favorite movies. I’m usually okay with the rush, or anyway with not being able to go at my own pace when I’m on a tour. I find it a bit frustrating but sometimes a tour is the right choice, or the only choice. What made this situation so infuriating was the wasted morning at Petra that we could have had at Wadi Rum. Don just watched Lawrence of Arabia and found it a bit of a slog. I’ve never seen it but I read about him doing research for this post. The man was a force of nature! Beautiful. I can see why you’d want to spend more time there, especially if you could suspend time at sunrise and sunset. That’s the problem with guided tours – not enough time. Thanks Dave. Yes, it’s very beautiful, very special. It was the timing of this tour that so frustrated me. We could have left Petra at 9 instead of noon and done a good hike through the desert to some of the iconic landmarks. That was all I would have wanted really. The landscape is definitely very Dune-like. Alison I may have to stop reading your posts as my wanderlust meters blows it’s stack. I can hear your frustration at the rushed pace. Tours can be a difficult thing . So wonderful that all the details are covered and yet restrictive because they are. We’ve done lots of day tours – it’s often a choice between a tour, a private guide, or exploring on our own. Each has their advantages, and time is always a factor of course. Almost always tours have been fabulous. And I must say that overall this tour was very good. It was just this weird thing of hanging out all morning in Petra and then being rushed through Wadi Rum. Just about did me in! Lovely post and Great images! Thanks so much Lisa. I must praise the tour for getting us out there for sunset and sunrise – always the best times for great shots, especially of landscape. As usual it was pure joy reading your post!!! I was with you through the journey, listening to you with rapt attention! Thank you so much Aishwarya. I’m so happy you enjoyed journeying with us. It’s a very special place. 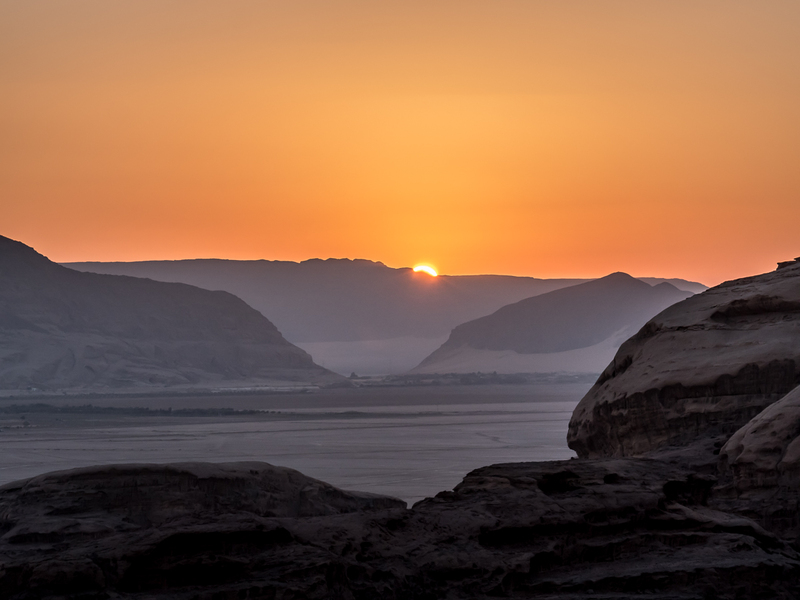 The Wadi Rum is a fabulous place and I’m sorry you didn’t get more time there. That said, you managed to get amazing photographs. Thanks for sharing them with us. Thanks Peggy, and you’re welcome. It is a fabulous place, really special. I’m so glad we went there even if it was only briefly. Thank you so much. It is a truly amazing landscape – everywhere we looked there was some new waves of sand or towering rocks. It was hard choosing which photos to use. 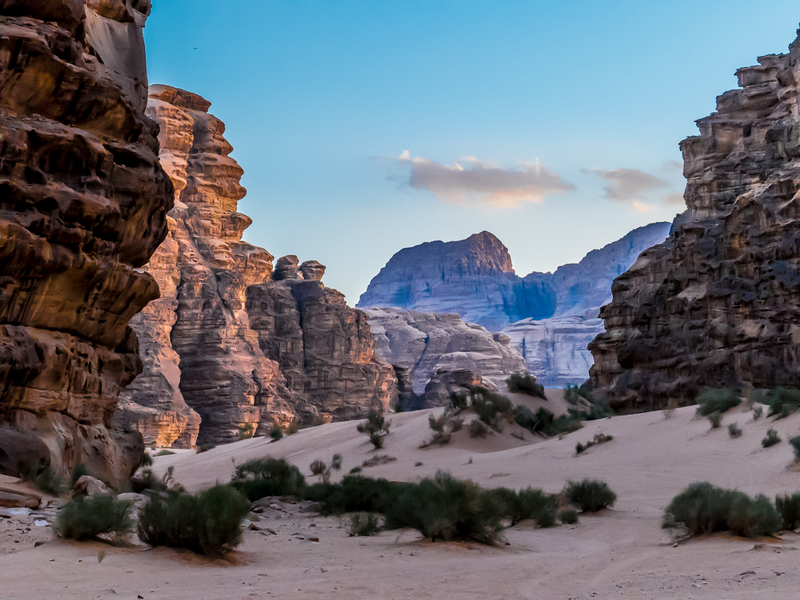 I never knew Jordan has such beauty to offer! Your pictures are amazing, and I quite understand your frustration for being allowed so little time to just be quiet in this awesome landscape. Question: would it have been possible to do this excursion privately, i.e. just the two of you? Or would that have been prohibitively expensive? I’m asking just in case Lee and I ever make it there ……. unlikely, since we’ve become such home-bodies, shying away from strenuous traveling ……. but one never knows, the travel bug might bite us again! Greetings to you and Don. Thanks Tanya. I’m usually a bit frustrated with tours, but I understand how they have to be. Until this one we’ve only taken day tours and I’ve been okay with the compromise. 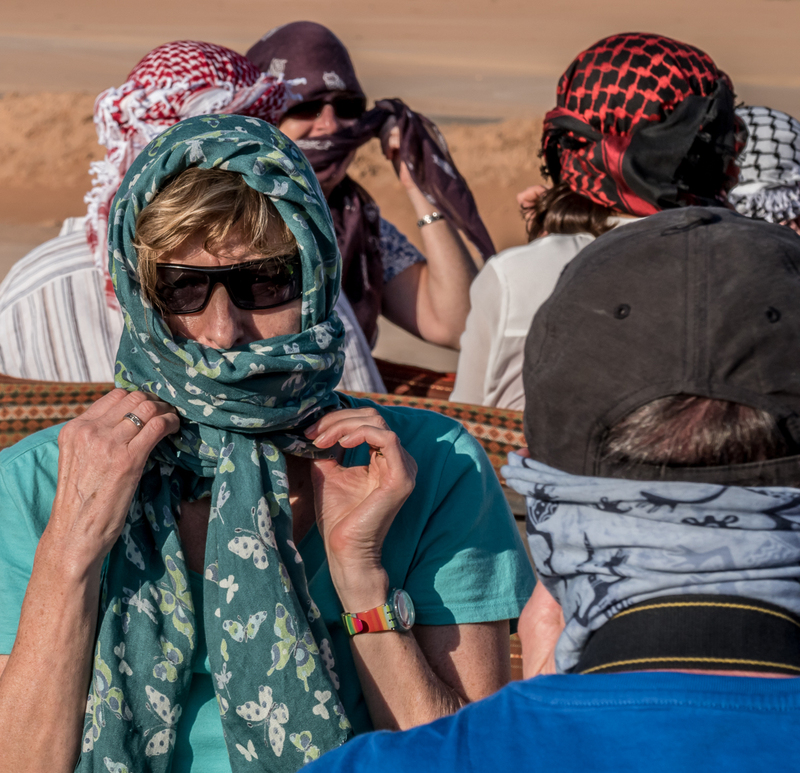 This visit to Wadi Rum was part of a week-long tour. What upset me more than anything was the wasted morning hanging around Petra. If we’d left at nine instead of noon and had those three hours for a hike in Wadi Rum that would have been all that was needed. I don’t now about overnight tours, but I do know you can do day tours from Aqaba. I would think you could also organize your own trip from Aqaba with a private guide and vehicle. Sorry, but I have no idea of the cost. 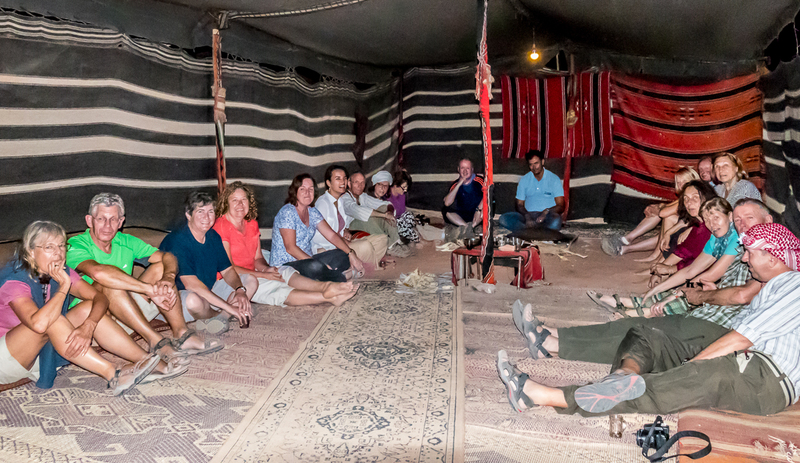 As I said, our trip to Wadi Rum was part of a week-long tour starting and ending in Amman. I’ll email you re Whidbey. Alison your posts on Jordan have been exceptionally beautiful and fascinating. Tours can sometimes leave you wanting more time and it certainly has been the case here, I hope you had the chance to give some feedback to the tour company so they adjust things for the future? Are you now relaxing back in Vancouver? Thanks Gilda. Jordan’s an amazing place; really worth visiting. I did send feedback to the company. 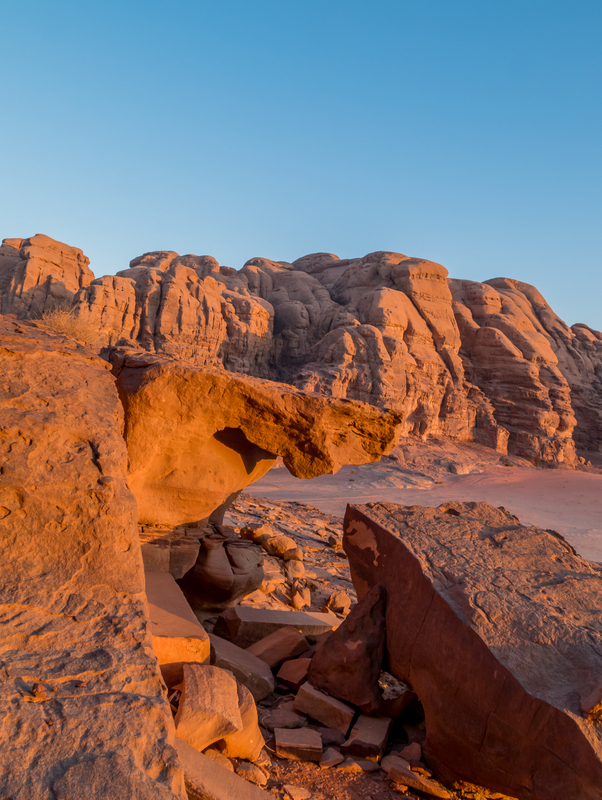 It would be such a simple fix – go to Wadi Rum in the morning instead of hanging around Petra. Anyway we have seen the amazing landscape of Wadi Rum so it’s not all bad. Yes, we’re back in Vancouver for a few months, relaxing somewhat, catching up with doctors, dentists, accountants, and all our friends. Yeah…that’s the deal with tours, you gotta follow their time schedule. That bothers me usually. Well, always. But sometimes it’s good to be on a tour because they take care of you in a place you might need taking care of, and show you all the good sites you might not find on your own. This tour, though, seems like it needs a little fine tuning on timing!!! I remember you once commented that someone said you put too many photos in your post. Have they seen your photos? How can there be too many? The first one is killer. Thanks BF. I must admit I’m generally pleased with this lot of photos, but with a landscape like that, and being there for sunset and sunrise, I’d be disappointed if I hadn’t got some decent shots. There’s much to be enjoyed about taking a tour now and then. You can really relax on the details. Except for this one time. Fine tuning on timing? No kidding! All we had to do was to leave Petra in the morning to give us a few more hours. It still both amazes and bugs me that it was organized the way it was. You’d think as often as they make that trip, they’d have it fine tuned?? I rented a car when I was there, so didn’t have to worry about any of that? Did you think of renting a car…or a motorcycle?!! I must admit we didn’t look into car rental. It would have been fairly easy to drive around Jordan I think. Still I don’t regret the tour if only because the way we were taken care of in Petra was so amazing. Yeah…well, that’s the GOOD thing about a tour—you are taken care, no hassle, no fuss, no muss, no worries. That is also the down side, too. I guess I’ll have to go back because all my photos are in slides!! Dang the luck. Well described and a terrific set of pics…nice to be actually on one!😊. Personal opinion is that maybe tour guides forget that it’s the first time for us visiting the area, an area they’ve seen many times, and forget tourists want to spend time taking in the environment. Maybe you’re right about our guide. He did seem to think that “there was nothing to do” in WR and was concerned with filling up the time with interesting activities for us. But he’d seen how we all enjoyed the hikes in Petra. Something like that in WR would have been fabulous. Something like – after “The Seven Pillars of Wisdom” viewing go straight to the camp and unload, and so people who can’t do a hike would have a place to hang out, then a hike for a couple of hours, then the jeep ride etc. My parents spent some time in Arizona a few years ago, and the desert there was so unlike the Midwest that I did what you wanted to do: take it all in and just let the imagination and the senses feast on what’s before them. Unfortunately, the rushed timetable is probably a combination of tourists who don’t like to just be in a place combined with, as Russ said, a forgetfulness of just how stunning the landscape is. Thanks Felicity. The sunrise was magical! I think I drove through the Arizona desert once many many years ago, too far back to remember it, and too young to know enough to stop and feel a place. You know I think he did us a disservice by assuming we wouldn’t want to just be in such a place, by thinking we needed to have every second filled. Even a two-hour hike would have been enough to feel the land under our feet, and he knew we were all (but one) good hikers from our time at Petra. Oh well, it was what it was, and what we did experience was pretty special. It’s one of the Earth’s truly special places. I have to agree with one of the previous comments that your lead in photo is amazing. 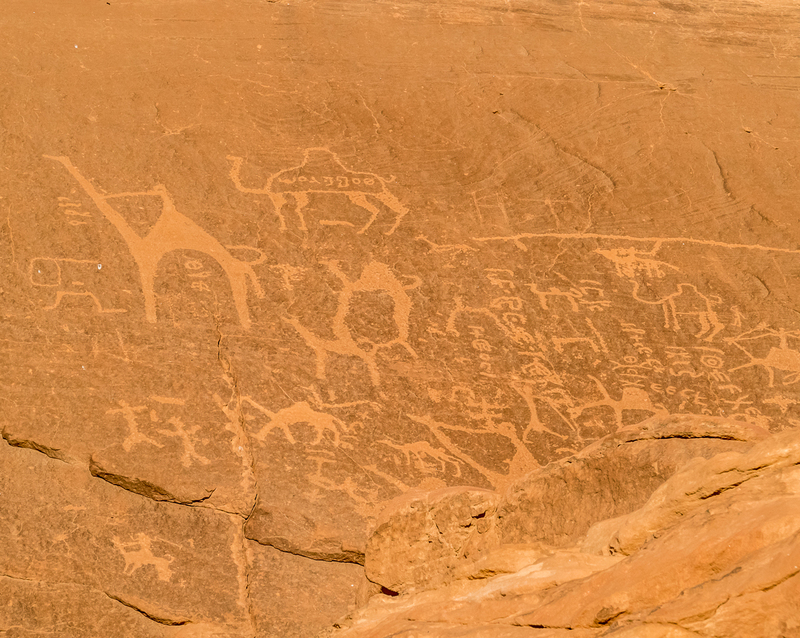 You have captured the timelessness of the desert so well throughout the entire piece – well done. That is in such stark contrast to the pace that you had to maintain on the tour. Thanks so much Tim&Anne. I took that lead photo from the bus as we drove by. I was totally captivated by the landscape. Thank goodness this pace was only for the Wadi Rum section (and as a consequence for the day in Amman which I’ll cover in a future post). The rest of the week-long tour was very well paced. That’s partly why I was so surprised, and disgruntled, by the pacing for WR. Glorious photography, Alison. Really feel your frustration at being so rushed. Thanks Ros. It’s a really beautiful and special place. I didn’t like being so rushed, but what I did experience was very magical. The downside of joining a tour group. 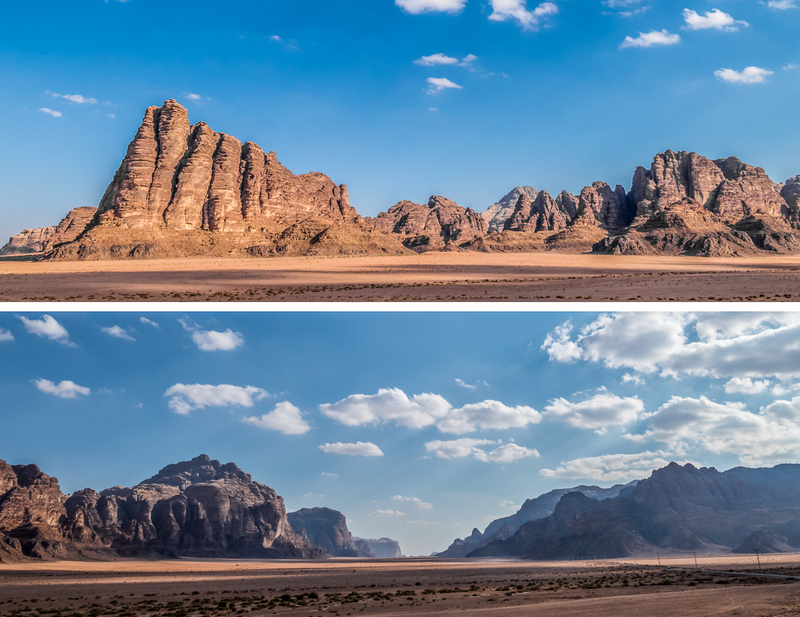 Oh well, at least you still managed to capture great photos of Wadi Rum’s breathtaking landscape — your photos seem to be ‘alive’. I can imagine myself being overwhelmed, at the same time inspired, if I stand where you stood. Thanks Wil, and you’re welcome. I love putting the posts together. It brings it all alive again for me too. The peace you felt when you stepped aside, away from that frantic pace, really came through in your photos. Will you ever take a tour again? Thanks Susan. Yes I had my moments of peace there where I could feel the majesty of the place. It really is quite magnificent. I’m glad to hear it came through in the photos. That’s a wonderful compliment. I think we will take a tour again. I must say this week-long tour of Jordan was very good except for the pacing of the time in WR. Apart from that it was great. Of course we learned about places I wish we could have gone to but didn’t, but that’s the same with everywhere we go. It’s impossible to see everything. We followed Jordan with a tour in Egypt that was really fabulous. And we plan to do a tour when we finally get to China because travel is reputedly so difficult there, mainly because of language difficulties. This post is amazing Alison! What an experience! One I could only dream of doing someday. Wow. Can’t wait for the next post! Thanks Nicole. It’s an amazing place! I hope you get there one day. It’s really special. Also your photos are stunning!!!! Such lovely pictures! You know what I would complain too if I was in this situation, always rushing and not being to just take in the beauty of this place. Thanks Suzanne. 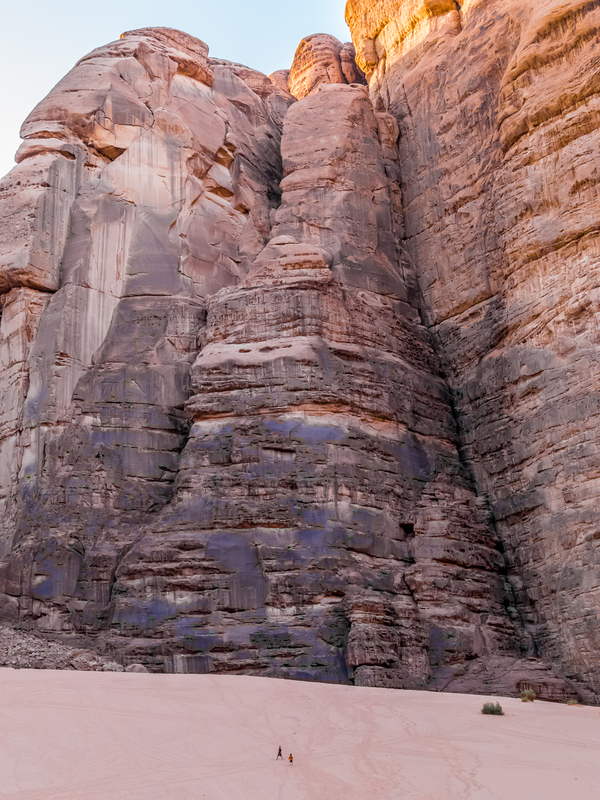 I must admit that even in the rush Wadi Rum is a photographer’s dream. I understand the limits of tours, I was upset that we’d wasted that whole morning in Petra when we could have spent it in WR. Hopefully he makes changes for future groups. Alison these photos are stunning. 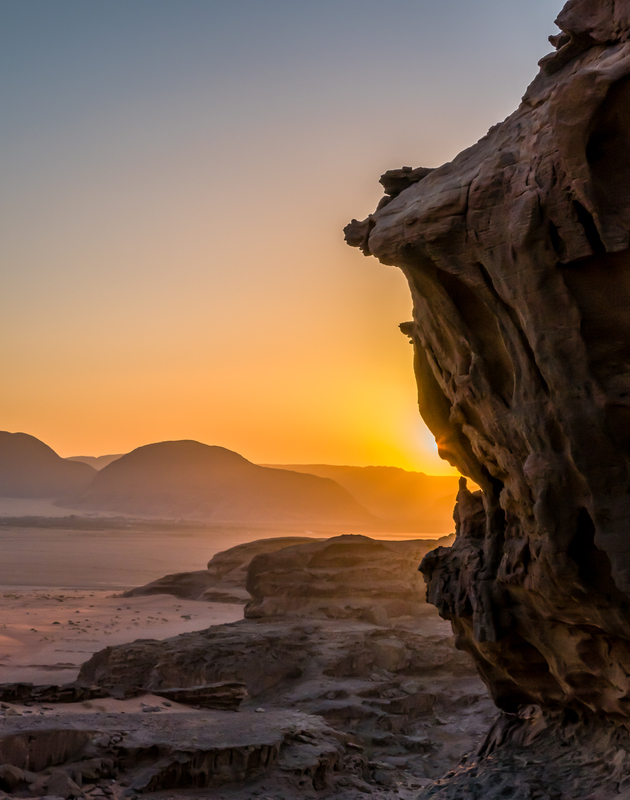 You certainly captured the essence of the feeling of the desert and the wadi. I totally get your frustration with the guide. Its definitely the reason we seldom join tour groups or use guides. I am just too badly behaved – irreverent and hate being on someone elses schedule. Sometimes though with a chill, laid back guide it could work. Thanks so much Peta. 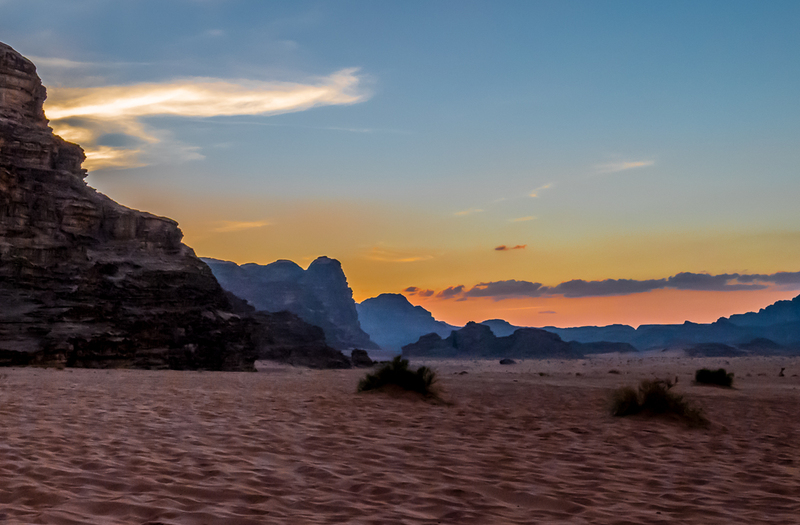 Wadi rum is amazing, a photographer’s dream. Our guide was good except for Wadi Rum. He’d been absolutely fabulous in Petra, and was great for the rest of the tour. Perhaps he was following the schedule set by the company. I wrote them about it. Maybe they’ve changed it now. We rarely do tours, and we don’t regret doing this one although of course we prefer independent travel. Beautiful post. It’s revealing about what tour operators perceive as the needs of the average tourist visiting such a magnificent place. Your photos, as always, are superb. Thanks Anne. It was interesting that the schedule for WR was so rushed, when we’d had two full days in Petra hiking all over the place. Surely it could be arranged to do a hike for a couple of hours in WR instead of hanging around for a morning in Petra. Maybe they’ve changed it. What’s with all the fish in the pic at the very top? They look rather crammed in – no room for movement. The fish are in a lake at a Buddhist temple in Hawaii. It’s a huge lake and they have plenty of room, but someone was throwing fish food into the water so they were going nuts to get it. 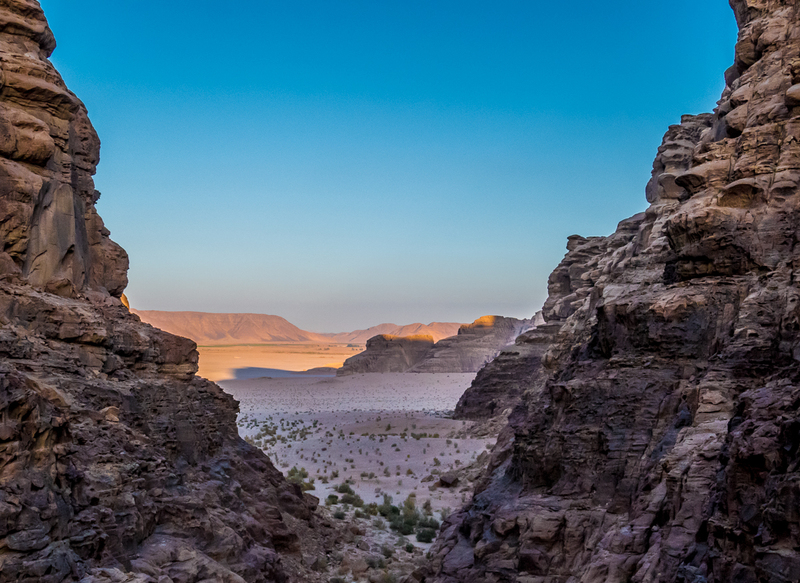 Having been to Wadi Rum mere months before you, I know how spectacular your photos are! It was not always easy to capture the size or color or even the mood of that vast arid redness, and you sure did it! The portraits of the people are particularly stunning. If it’s any consolation, we had a private driver/guide, and we felt a tad rushed along also! 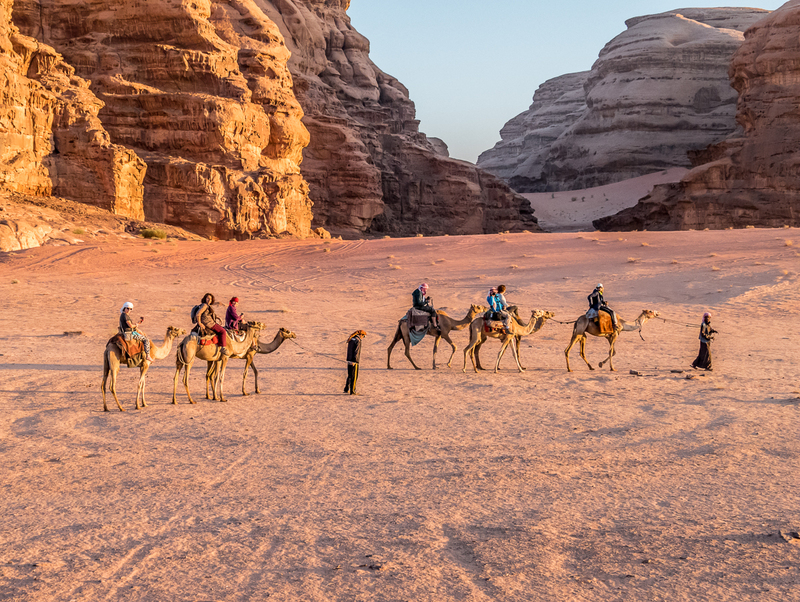 It’s always worse when a crowd has to assemble with all their stuff, but maybe it’s the nature of the industry there that they plan on a certain number of hours in Wadi Rum, and that’s all you get. (?) Rushed or not, I felt, like you, the enormity and quietness of where I was when I ventured off for a short while, and it was worth it even for that short time. Thanks so much Lex. The landscape is so amazing it was a feast to photograph it. Well it is some consolation to know that even with a private driver you felt rushed. But as I’ve said in other comments it really seemed like madness to me that we spent a morning in Petra doing nothing when we could have driven to WR and gone on a hike. It was what it was. And I will always remember that extraordinary landscape. Great photos and vey detailed. I like it. 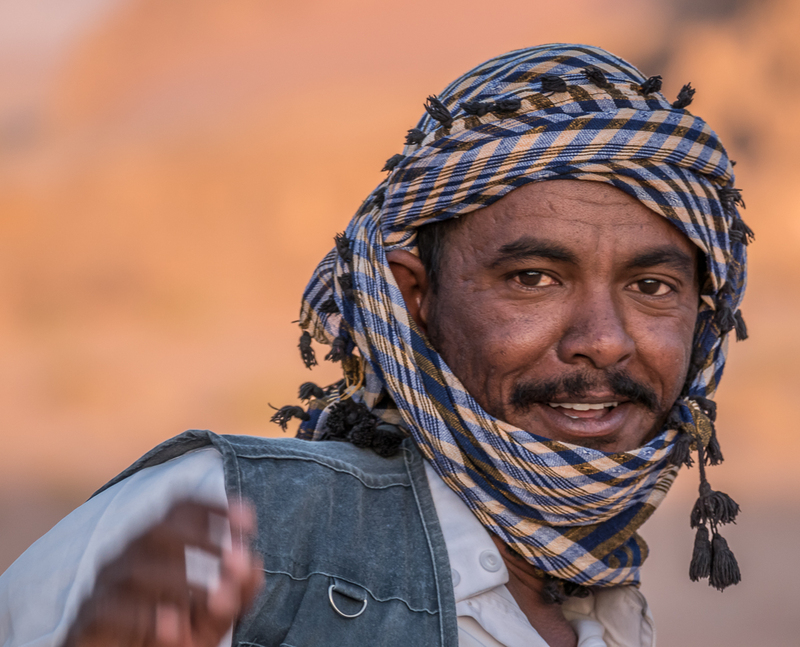 To your guide in Wadi Rum, the day you traveled was, for him, a day on the job. 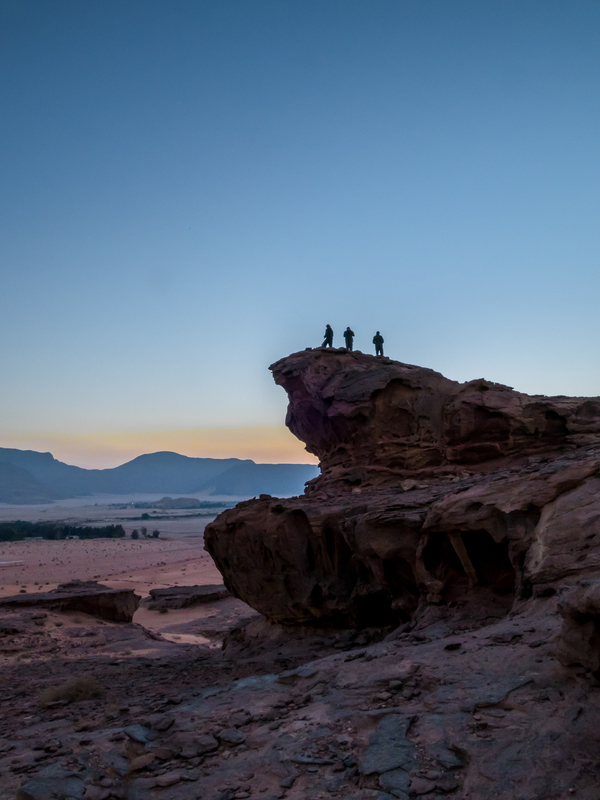 I wonder what he would have replied if you’d asked him to show you the one thing he would miss if today was his last day ever – in his life – to see Wadi Rum? I wonder what he would have chosen? A case in point – This weekend was my first drive this season to our little RV property in the Rocky Mountains. The route takes me through some famous ski towns – Vail and Breckenridge – and over two mountain passes to reach the property. I noticed the out-of-state drivers and myself were traveling noticeably slower than the rest of the locals. I assume we slow movers were keeping the windows open to smell the fresh air and to hear the mountains streams gurgling at their maximum spring flow, to take in the beauty of swaths of wild purple iris next to the roadside. What would the locals have shown us if we’d have asked them to point out the one thing they would miss if today was their last day – ever – to drive that very route? I suspect the answer to the question – the one thing you would miss about a familiar environment if today was your last day to view it – would greatly depend on gender, age, experience, and culture. I hear your frustration in your attempt to bridge and communicate those differences. I don’t know what he would have shown us. I don’t know if this was his schedule or the schedule given by the tour company. And even writing this post I still didn’t say it all. I’d have been happy with a hike out into the desert or up on those rocky escarpments. Really I wanted time to be there – time to be in the desert landscape either simply sitting, or wandering, or going on a hike for a couple of hours or all of that. My frustration came with us a) having hiked all over Petra for two days so he knew what the group was capable of, and b) spending a morning in Petra doing nothing. Apart from this one time the rest of the tour ranged from good to great and I would recommend it. 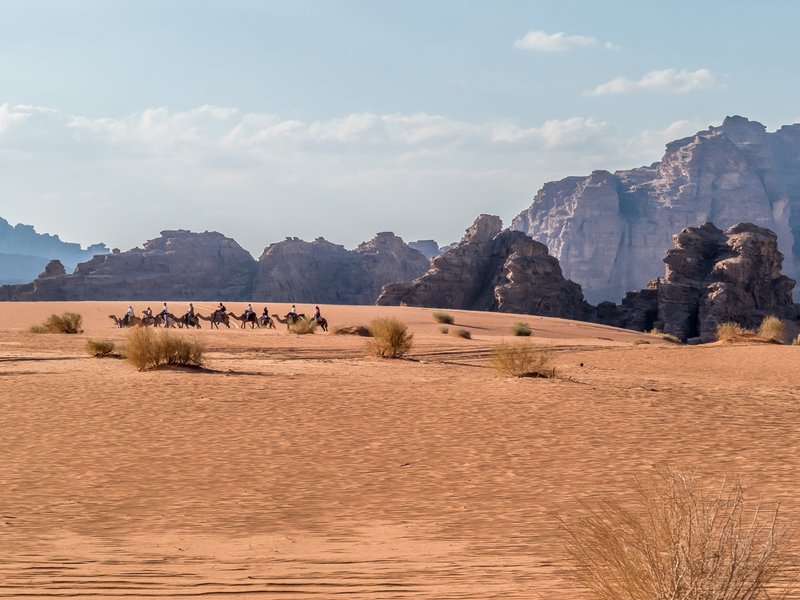 I would especially recommend it if they’ve changed the scheduling for Wadi Rum. Thanks Anita. You’re exactly right – all we needed was a bit more time to absorb it. Most of the tour was well scheduled. 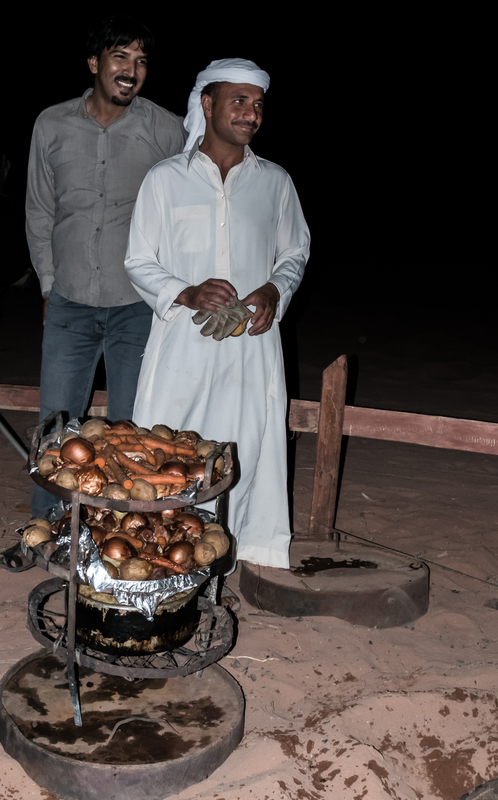 It was only at Wadi Rum that it was nuts. I still can’t figure out why it was set up that way. Alison… your photos… breathtaking. 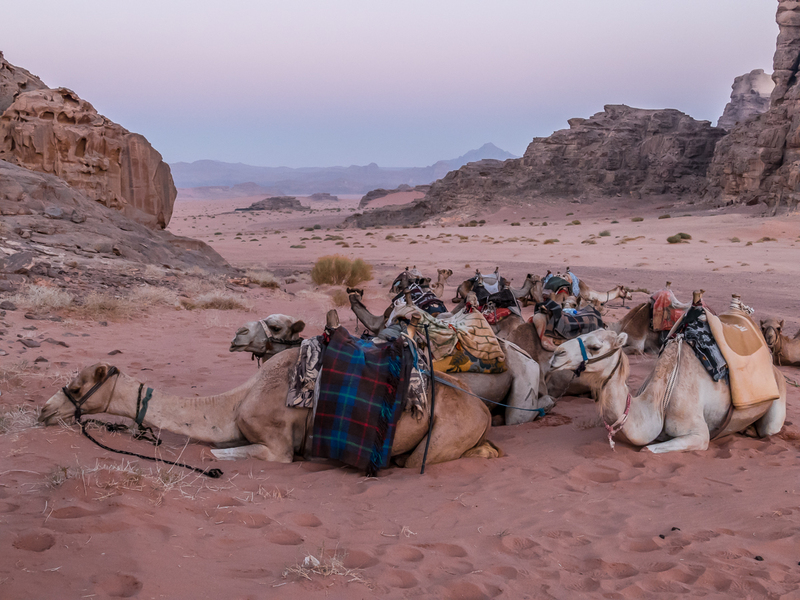 They make ME want more time in Wadi Rum, too, and I haven’t even been there! Such austere beauty. The march of time and history is palpable in the landscape, and I can understand your frustration in having to rush through it. Sometimes being still is the only way to comprehend a place like this. I felt that way in Oman. Superb post! Thanks so much Kelly. WR is definitely a photographer’s paradise – such a spellbinding landscape. I hope you get some time there one day. And that I get some time in Oman! (I loved reading your posts about Oman.) 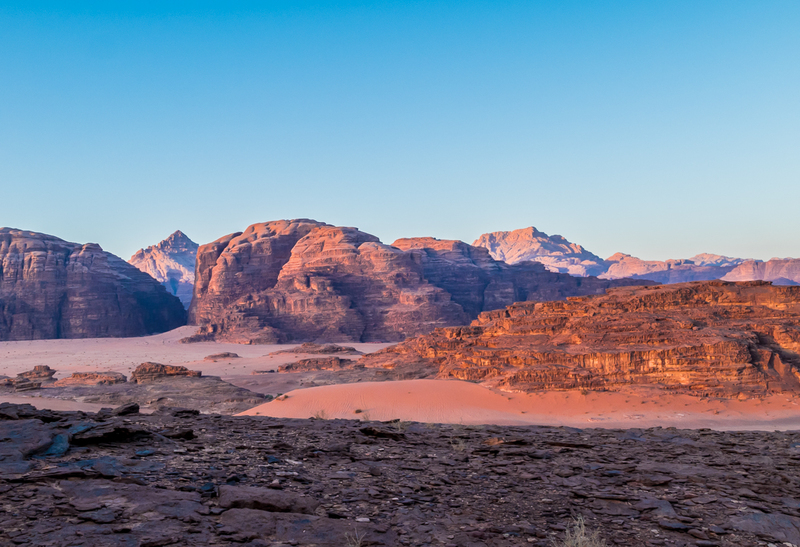 We might go to Morocco next summer, and will do a desert excursion there – to make up for the rush through Wadi Rum! wow what an experience of a lifetime! and the photos! breathtaking! Thanks Mani. It was truly amazing! Lovely post. What surprised me the most about your photos is the blue haze: the distant mountains are always blue. Normally this is due to moisture, and I’d kind of thought that a desert is too dry for a blue haze. Could it be due to dust? The dust grains would have to be too small for this to happen. Mystery! Thanks so much. I guess the blue haze is a mystery, at least it is to me. I didn’t even know that moisture is usually the reason for blue haze. It is nice to have friends that travel around the world and know the blog things, and, I could reference their experience. Hi Kenny. We rode camels in Australia for about an hour or so and it was not uncomfortable. I think I got a camel with a very old saddle that was broken down. Not sure what it was really in Jordan, but camel riding in Australia was fine. I would definitely not recommend 6 hours, but I would recommend it for a shorter ride. It’s an amazing experience. Have a fabulous time! OMG I just realised it is you! Kenny and Anna! I just read quickly through and didn’t make the connection right away. How are you guys?